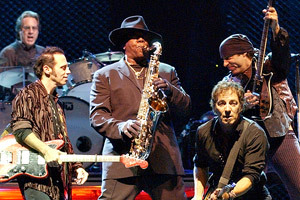 Clarence Clemons, who died on Saturday at 69, didn't just bring life to Bruce Springsteen's music. He didn't just set rock-and-roll's standard for on-stage sidekicks, and he didn't just flirt and wink and point to pretty women with their hands raised more than any other member of the E Street Band. The Big Man knew how to bring warmth to sad moments. AP Photo/Mary Altaffer The Big Man on stage at Shea. Lord knows the New York Mets had plenty of those through the years at Shea Stadium, where I attended the last show of The Rising tour in October 2003. From my seats near third base, I could tell that Bruce wanted the rainy evening to be special. It was obvious from the sax-heavy set list -- "Night," "Prove It All Night," "Light of Day," "Bobby Jean," "Back in Your Arms" -- that he also wanted it to be Clarence's night as much as his. Which makes sense. So many of Springsteen's songs are sad and desperate. Some, like those on "Darkness on the Edge of Town," are transparently so. But most are brilliantly disguised in the warmth of a sax solo. That's Bruce's genius: He writes sad songs that somehow make even the most jaded New Yorkers and New Jerseyites happy. That mission couldn't have been accomplished without Clarence. Bruce has said that he considers the sax a warm sound. Just when you began to notice that "Hungry Heart" or "Dancing in the Dark" or "Ramrod" or "The Price You Pay" are serious downers, Clarence would come to the rescue. And so it was that night at Shea, with the Big Man pounding his horn and warming the crowd like at a baptism. Chargers still among the elite?